Fairway House was built as a gentlemans residence in 1901. 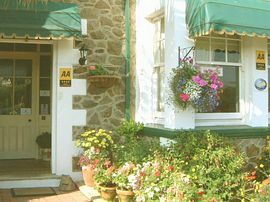 Situated in the lovely North Cornwall seaside town of Bude and has been our home for the last 10 years. Now lovingly renovated and restored to provide charming ensuite accommodation where you can relax and completely unwind. Stylishly decorated and comfortably furnished throughout, we provide all the usual 4 star facilities plus lots of useful, thoughtful extras to make your stay that extra bit special. There is an interesting and varied breakfast menu to help ease you into the day. Overlooking the fairways of the Bude and North Cornwall Golf Club, we are ideally situated both close to the town centre, with a good choice of shops, restaurants and bars available and Crooklets Beach which lies a short stroll away, just at the end of our road. Whether for your annual holiday or that vital and much needed short break ...... come and find out just why it is that so many of our guests choose to return again and again! Fairway House is a fully non smoking establishment. Reductions for weekly stays, children sharing with parents. A Spring Short Breaks Package is available. We open in the middle of February and close in the middle of November. From the A39 take the road signed to Bude (3072) and enter the Town Centre. Follow the one way system up the main shopping street and when you reach the Golf Course look for the Brown Tourist Directional signs for Downs View.